With the rise in influence and variation of user-generated content, different forms of moderation are required to keep brands and end-users protected at all times. 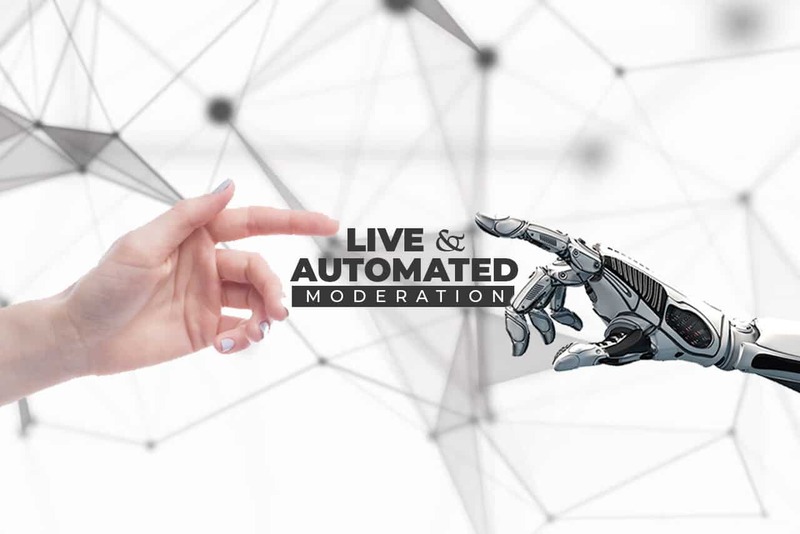 Ideally, automated (AI) and live (human) moderators should work together to produce optimum results for moderating content on your website and on your online communities. However, comparing the difference between how the two operate individually, how each surpasses the other as well as how each benefit a brand is also a must. 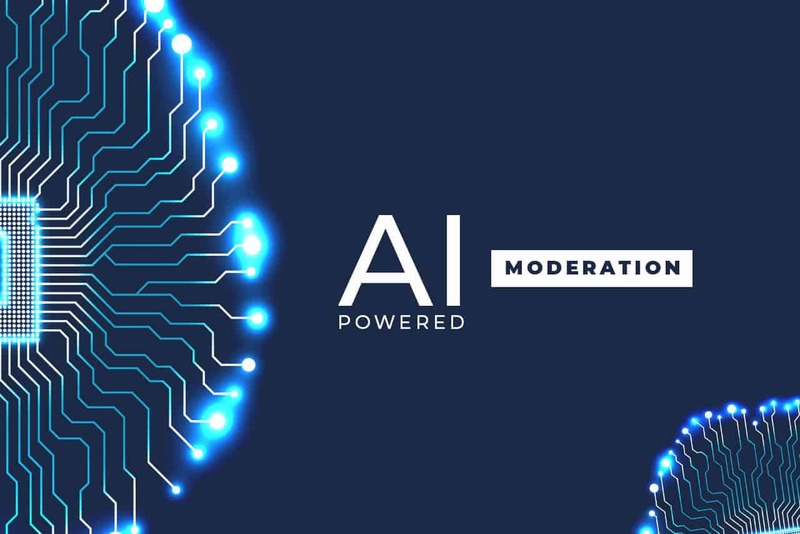 An AI moderator is able to accomplish moderation tasks in bulk. It works best for repetitive and routine tasks that include detecting and deleting duplicate content, reading captions and metadata on images, as well as sorting files and images. The sheer quantity of user-generated content that needs to be regularly checked and monitored by live moderators is intimidating. In a brand’s social media page alone, the number of posts shared by end-users consistently rises that human moderators are forced to keep up with the pace. Not only that, encountering user posts with very disturbing content is a constant part of the job. Auto or AI moderation exceeds live moderation in terms of psychological stamina. Constant exposure to inappropriate content, particularly those that graphically promote extreme violence, hate, racism, and harm to other people is a scene that can haunt a person’s peace of mind every so often. But, AI can be programmed simply to sort, detect, and eliminate unwanted content. Without the emotional component of content moderation, the result is a faster and more continuous monitoring process. Automated content monitoring functions through the creation of a so-called base model for the type of content it must moderate. For example, an AI moderator is employed to detect images depicting drugs or drug use. The AI will then be shown tons and tons of pictures of different illegal drugs, people using drugs, along with the apparatuses needed to take in prohibited substances into a drug user’s body. This step is stored as reference for the AI once it starts sifting through dozens of images in an online community. Another way auto moderation can be programmed to moderate user-generated content is through natural language processing. It involves the smart derivation of content and cues from human language in order for a machine or AI to check, detect and moderate user content more aptly. An example would be the use of semantics to detect and filter words and languages used in forums, comments, and chat messages so that remarks and posts that are detrimental to the brand’s online community and end-users can be understood and processed more accurately. Creating blacklists that contain words, phrases, and keywords for visual content to enable quicker detection and elimination of unacceptable content shared by end-users. The beauty of AI moderation is brands are given an opportunity to program and custom-fit a set of guidelines to keep their business and end-users from being exposed to or associated with inappropriate content online. The process allows the prevention of disturbing and unacceptable content from surfacing on a business’ online branding channels. Just like any other software designed to assist in a business’ online branding efforts, AI moderation also has its shortcomings. However, these shortcomings should not be taken as a disadvantage, but rather, an opportunity to fortify a brand’s defense against malicious online content. AI lacks in qualitative judgment—a blind spot that human moderators can easily cover. Brands can use this limited ability to scrutinize and judge user intent as a basis and a ‘reflector’ of how scammers and fake community members bypass the guidelines set by automated moderators. For example, if an AI moderator fails to distinguish a highly offensive user content concealed through replacing letters and words with symbols, then this means that its base model could be upgraded to distinguish sneaky ways that disturbing and offensive UGC may be passed as safe or nothing out of the ordinary. With live moderators, a brand is able to establish a human connection with its end-users while enforcing strict compliance to posting guidelines on its online community. Compared to technology operated moderation, content moderation accomplished by humans is more accurate and flexible. For instance, an end-user posts a comment about an anti-bullying campaign. An AI moderator would concentrate on the keywords ‘bully’ and ‘bullying’ but may disregard the intention of the person who posted the comment. Whereas, a human moderator would be able to distinguish that the end-user’s purpose is not to promote bullying, but rather, to inform fellow users about an initiative to put a stop to bullying. The subjective judgment of human-operated moderation aids in identifying subtle ways end-users express displease over fellow members or share content that may seem harmless at first but are in actuality, very offensive to a select group of people. Sensing a wide variation of human emotions and the complex ways they may express it is how human moderation is able to discriminate intentionally harmful content from those that are not. After all, human emotions and online expressions ranging from comments with dual meanings, exaggeration, sarcasm and slang cannot be measured using a ‘black and white’ scale of judgment alone. There may also be certain cultural references that AI may not be able to recognize given that it is not programmed to detect such type of content. Another distinguishing feature of human moderation is its capability to pinpoint fake news from real, reliable sources of information. There are people and organizations whose expertise lie in creating websites that share convincingly real news and information. When fake news is presented to an auto moderator, it may not be able to distinguish or perceive fake, misleading information from credible news and articles. Unless the AI is programmed to monitor false news, it will end up allowing fake information to be posted on the brand’s website. Live moderation can also be outsourced. This is especially applicable to brands regularly catering to large volumes of end-user content. Outsourcing human moderation likewise benefits countries that have offices and branches overseas. Hiring people overseas to moderate user content, especially in areas where a brand has a target audience or a branch office, effectively eliminates moderation issues related to language and cultural context. Live or human moderation has the tendency to scrutinize user posts with intrinsic bias, making its moderation slightly skewed with personal opinions and beliefs. If a moderator is not trained enough, it may affect the moderation process in a way that the judgment may not be as objective as it should be. When this happens, disputes could arise between the moderators and online community members. Moreover, with moderation that’s operated by humans, the keen attention to detail may deliver performance that’s higher in quality but significantly lower on speed. This means moderation process may be slowed down and moderation cannot be accomplished in real-time. AI moderation exceeds human moderation with speed. Most of the time, a brand’s online community is bombarded with dozens and dozens of user-generated content. If a brand has limited manpower for managing all the content it receives on a daily basis, then it could take a toll on the mental and emotional well-being of the moderators viewing all the disturbing content being posted, uploaded or shared by a brand’s followers. Evaluating the individual features of both types of moderation allows brands to put the significance of moderation services into perspective. It is not about finding a way to make these two types of moderation compete. Rather, it is all about being able to strike the perfect balance between the individual roles and imperfections of AI and human moderators. A great example would be to expand the predetermined standards for auto moderating user-generated content. 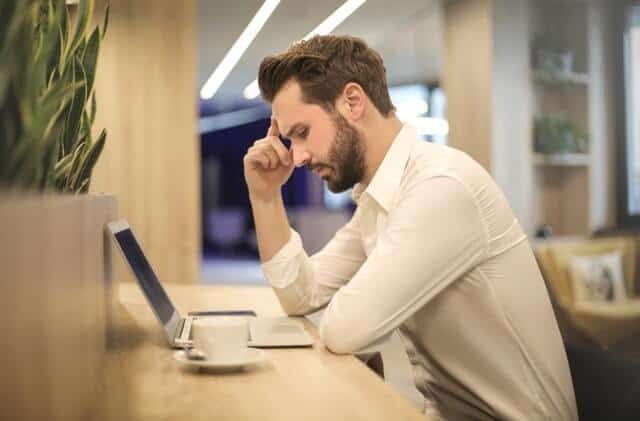 By consistently updating AI moderation’s base model, then the possibility of it taking on more sensitive type of content can dramatically aid in diminishing the high stress levels that human moderators are constantly suffering from. It can also make moderation run by technology more flexible and efficient particularly when monitoring user content that is more complicated in nature. In addition, AI moderators can be taught how to check videos on live stream to maximize a brand’s defense against malicious user content. Imagine a scenario where both AI and human moderation can simultaneously check image and video content in real-time—there is a huge possibility that the amount of disruptive content trying to harm a brand’s reputation would dramatically diminish. Another scenario where AI moderation and human-powered moderation are excellently complementing each other is making AI moderation concentrate on filtering profanity, deleting spam, detecting posts with inappropriate content, as well as accepting and rejecting user comments. In return, much focus will be given by human moderation to surveying any abnormal behavior or activity of members in a brand’s online community, along with checking user posts with highly sensitive content. 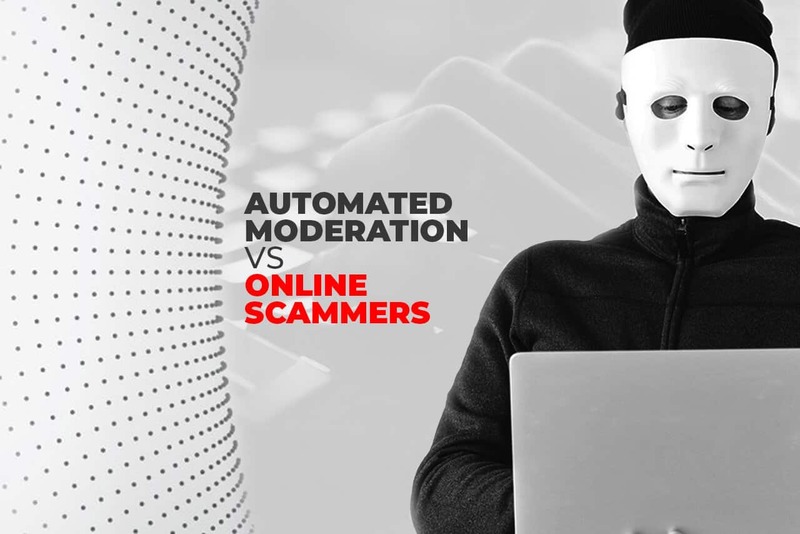 The perfect combination of speed (auto moderation) and quality (live moderation) is a fatal weapon that brands can use against hackers, scammers and netizens whose goal is to harm brands and its end-users.